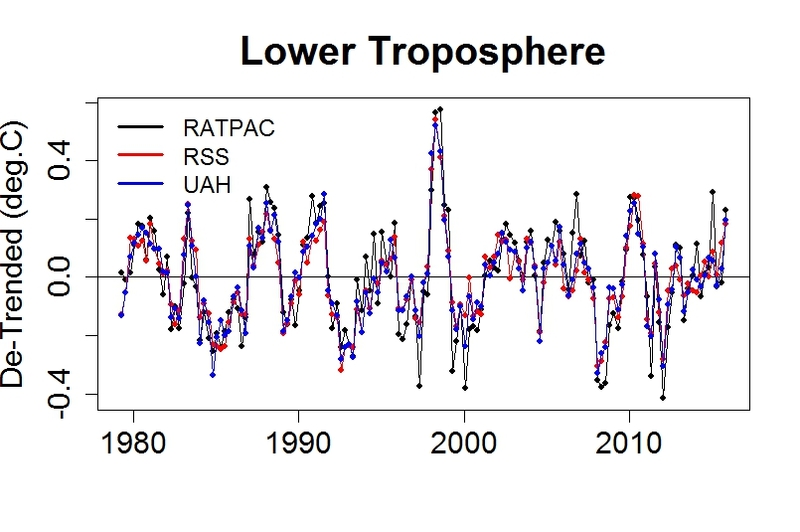 Eli’s approach was to compare the land-only part of RSS to the surface temperature data from CRUTEM4, from 2005 through 2015. 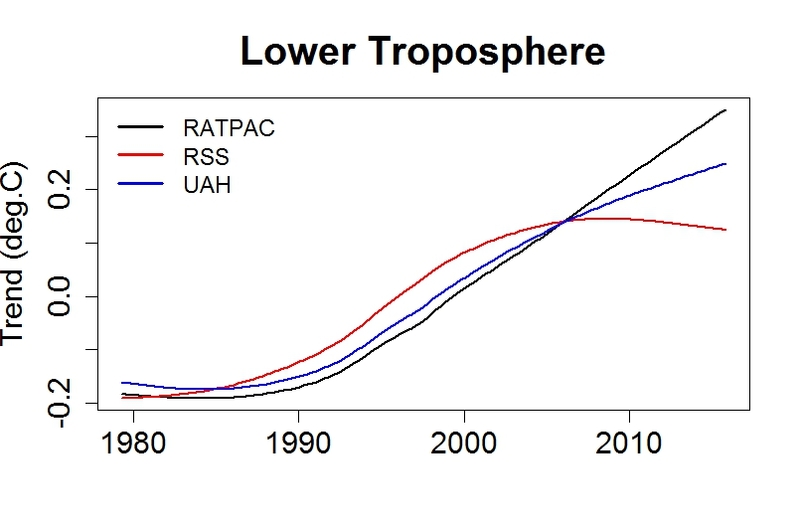 It occured to me to compare things that are supposed to be measuring the same thing (at least approximately), the lower-troposphere temperature from RSS and UAH, and the lower-troposphere temperature from RATPAC (for the 850-300 hPa level). Just from the satellite-vs-surface comparison, Eli finds that “MSU and CRUTEM4 are consistent on a monthly and even an annual basis.” But for the short-term stuff as shown here, MSU and RATPAC are beyond consistent — they’re stunningly similar. Yes, they’re measuring the same thing, at least (very very) approximately. No doubt about it. Yes, they’re drifting apart. No doubt about it either. This uses UAH v5.6, but Spencer and Christie are trying to switch to their v6, which is a lot closer to the RSS result. Their reasons are unclear — but the suspicious among us might think it’s because it’s a lot closer to the RSS result. But the upshot is that there is drift — the instrumentation issue, most likely with the satellite data, isn’t a short-term fluctuation thing, it’s a long-term drift thing. As per the chief bunny, I’ll also point you to Nick Stokes. As for the “Cruz pause,” it’s about as believable as the “Monckton pause.” Interested bunnies can decide for themselves which of the two should feel more insulted by the comparison. If you like what you see, feel free to donate at Peaseblossom’s Closet. And thanks to those who have. You’re great! Say guys, want to write a paper? Very nice. Ugh, the Engineers are denying it up again today on the Faculty email list. 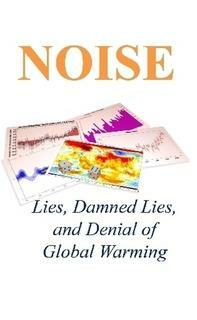 One of the specimens is a so called expert in time series data. Awful, embarrassing, depressing. There are other radiosonde datasets as well, but they stop in 2012. However, their somewhat shorter trends would also fall between the red and yellow trendlines in the chart, way above the cool blue ones, that the deniers cherry-pick and like.. Remember Pinko, it’s the surge! the surge! Weng et al (http://link.springer.com/article/10.1007%2Fs00382-013-1958-7) reported that lowest AMSU channel were significantly impacted by cloud liquid water, with higher rates of warming when cloud effects were ‘removed’ (or at least when only “clear-sky” data were used). Could the ‘drift’ in satellite temps be related to this cloud contamination, given that water vapour is apparently increasing in the lower atmosphere (https://www.ipcc.ch/publications_and_data/ar4/wg1/en/ch3s3-4-2-1.html)? Would it not be interesting to see what Po-Chedley’s work on the MSU correction gives? If this is a problem with the satellite or the MSU it should show up there as well. If not it is a methodological issue with S&C – but I’m inclined to assume innocence where they are concerned. So there is something affecting the diurnal drift, if eliminating it effectively gets rid of the problem. Yeah… you folks can do this. I’m vying to be a pet in that household, Bernard. (I have mentioned my uninformed suspicions about that dark gray cloud you can see moving around over and downwind of India (and sometimes clearly fenced in by the Himalayas) in all the DSCOVR imagery). Someone please tell me it’s covered so I can quit asking whether the increase in smog thereabouts could have begun confusing the satellites in the past 10-15 years.